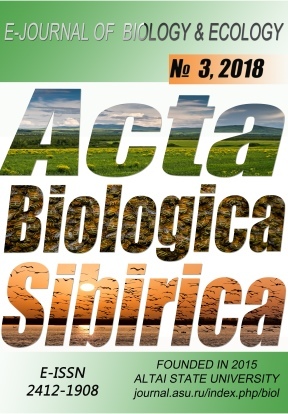 Three species of the genus Poecilus Bonelli, 1810: P. cupreus (L.), P. versicolor (Sturm) and P. lepidus (Leske) inhabit the agrolandscapes in Northwestern Russia. Two the most numerous species are P. cupreus and P. versicolor. They differ by the areas they occupy and their abundance on the various parts of a landscape. P. cupreus occurred mostly on the fields, more rarely – on their boundaries. P. versicolor lives mostly on the field boundaries but can be also seen on the cultivated lands and forest edges. Some P. lepidus individuals can be observed only on dry and warmed open areas. The population of the ground beetles of the genus Poecilus varies significantly between the field and its boundaries. Budilov, V.V., Budilov, P.V. (2007). Prostranstvenno-vremennoe raspredelenie karabidofauny (Coleoptera, Carabidae) v agrocenozah Srednego Povolzh'ja. Saransk: Mordovskoe knizhnoe izdatelstvo (In Russian). Guseva, O.G., Koval, A.G. (2008). Characteristics of carabid complexes (Coleoptera, Carabidae) in agrocenoses of Leningrad region under different soil conditions. Vestnik zashchity rastenij, 4, 3–11 (In Russian). Guseva, O.G., Koval, A.G. (2010). Food connections of ground beetles Pterostichus melanarius and Poecilus cupreus (Coleoptera, Carabidae). Vestnik zashchity rasteniy, 1, 61–63 (In Russian). Guseva, O.G., Koval, A.G. (2011). Regional distribution of Carabidae and Staphylinidae in agroecosystem. Selskohoz. biologija, 1, 118–123 (In Russian). Guseva, O.G., Koval, A.G., Vyazemskaya E.O. (2015). Ground beetles (Coleoptera, Carabidae) of agrolandscapes in the Northwest of Russia and features of their species composition in various agrocenoses. Vestnik Zashchity rasteniy, 4, 20–26. (In Russian). Koval, A.G. (2009). Carabid beetles (Coleoptera, Carabidae) of potato crops in European part of Russia and adjacent territories. St. Petersburg: Russkoe entomologicheskoe obshchestvo (In Russian). Koval, A.G., Belousov, I.A. (2001). Vozmozhnost' primenenija v zashhite rastenij mestnyh vidov jentomofagov. Entomol. obozrenie, 80, 4, 823–829 (In Russian). Koval, A.G., Guseva, O.G. (2008). Structure of the ground beetle (Coleoptera, Carabidae) complexes in the potato field agrocenoses on different soils in Northwestern Russia. Entomol. obozrenie, 87(2), 303–312 (In Russian). Koval, A.G., Guseva, O.G. (2016). A study of distribution of the ground beetles larvae (Coleoptera, Carabidae) in field crop rotations. Vestnik zashchity rasteniy, 2 (88), 26–32 (In Russian). Lindroth, С.Н. (1985). The Carabidae (Coleoptera) of Fennoscandia and Denmark. Copenhagen: Scand. Sc. Prcss Ltd., 1–227. (Fauna Entomol. Scand, 15, l). Sunderland, K.D. (2002). Invertebrate pest control by carabids. The agroecology of carabid beetles. Andover: Intercept, 165–214. Wallin, H. (1988). The effects of spatial distribution on the development and reproduction of Pterostichus cupreus L., P. melanarius Ill., P. niger Schall. and Harpalus rufipes DeGeer (Col., Carabidae) on arable land. J. Appl. Entomol., 106, 5, 483–487.